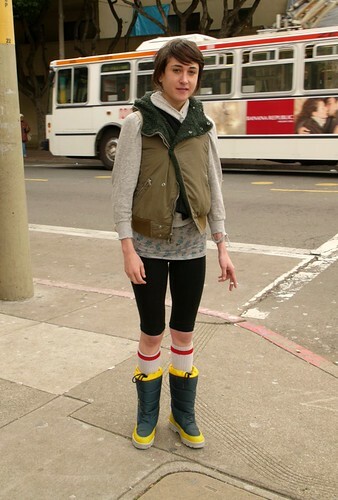 This girl clearly has an original sense of style. Her outfit has so many childish elements - the '80s winter boots, the boyish knee socks, the flower-print undershirt, and the children's-size vest with just the top button done. Amazing how well it works. This look creeps me out a bit, I can't quite say why. Maybe it's the little-girl elements. Either way, great shot. Hi alice - ha. her look is definitely not everyone's cup of tea, but i admire how odd, even daring, it is, without being flamboyant. i'd love to see what she wears on other days. I noticed this when you first posted it, but stopped by to say I can't stop thinking about it! I just imagine she is on a cigarette or milk run, and manages to still look cooler than everyone else. Hi SB - I agree; there was something just so effortlessly odd/cool about her. Her look does what I love most about fashion - it hints at her personality, lifestyle, etc.